It’s only spring football, a time for tinkering and working out who the star talents are and how to maximize their abilities. So any tinkering with something as important as the defensive front has to be taken with a grain of salt. I’ve seen numerous programs over the years quietly or boldly announce some changes to the way they play their front. At times they’ve made real changes and at other times they defaulted to their previous base schemes. 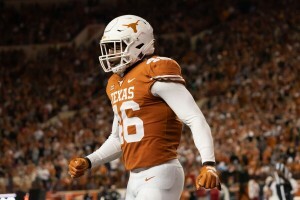 One of the questions coming out of Texas’ spring is whether they are going to move to a four-man front or stick with the base three-down they’ve been leaning on for the last two years. We do know, or at least strongly suspect, that Malcolm Roach and Joseph Ossai will be key components to the front but how exactly the staff will deploy them remains to be seen and likely isn’t firmly settled publicly or privately. There’s a lot of factors at play here and a dozen variables for the staff to sort out in determining what the best fronts and tactics are for this group to allow them to go beat LSU and the Big 12 in the fall.